Some people love having an excuse to get all dressed up and drink champagne and discuss current events. Other people groan at the thought of having to find the right outfit and watch what they say all night. For better or for worse, formal events tend to have pretty strict dress codes, which is why you should learn how to style yourself in an appropriate manner. If you’re a man trying to piece together an outfit for a formal event or a fundraiser but don’t want the expense or discomfort that comes along with a tuxedo, you should consider a dress shirt and dress pants combo. Dress shirts are known for their versatility and can be worn to work and casual events without the wearer appearing out of place, so they require very little effort to style. In fact, dress shirts are so commonplace that there’s a good chance you already have one hanging in your wardrobe. Congratulations, you’re halfway there! Dress pants, however, are a little more complicated. 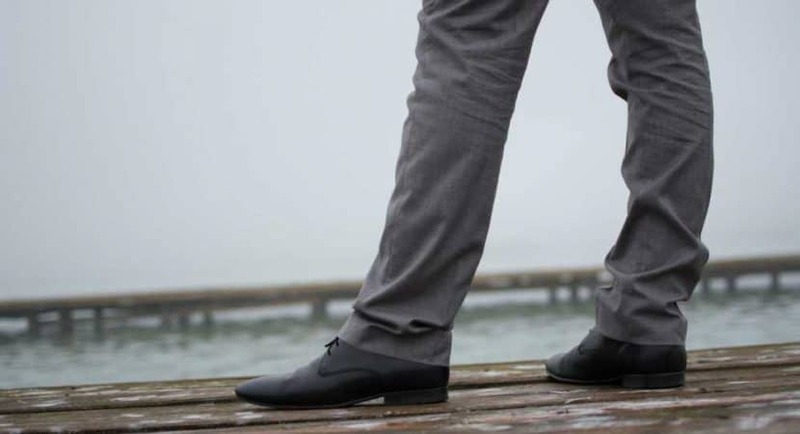 When it comes to fitting mens dress pants, you must take a number of areas of your lower body into account, including your waist, your thighs, and even your ankles. A quality pair of pants should cling to your waist, shaping your rear without causing any discomfort. If your chosen dress pants are too tight around the waist, they may irritate the surrounding skin or cause a stomach ache, the latter of which you certainly don’t want if you’re attending a dinner party. A belt should not be necessary to hold your dress pants in place, but you can add one to your outfit as a stylistic choice. In contemporary fashion, it is considered rather unstylish to wear a belt that is the same color as your trousers. Instead, try wearing a belt that matches your shoes (but never one that matches your shirt). Below the waist and above the knee, you want your dress pants to run close to you your skin. A general slim fit is advisable, but you can go a little tighter or a little looser according to your preferences. That being said, you never want to go so loose that your trousers sag in the rear. Sagging jeans may be in right now, but sagging dress pants most definitely are not and will give you a real “used car salesman” vibe. Sagging is commonly seen in less expensive dress pants, which is why you should resign yourself to spending $50 or so on a quality pair of formal dress pants with a better fit. If you don’t quite have the eye for fashion required to determine if your dress pants are too loose to be stylish, try pinching 2 inches of fabric on your outer thigh. If you can do that, it’s a safe bet that your dress pants are too loose and should be taken in or returned. Commonly accepted guidelines state that you should be able to pinch no more than 1 inch, if that, while being unable to pinch at least half an inch is a sign that your trousers are too tight (although you’ll probably be able to feel that). When it comes to your legs below the knee, your dress pants can either grow thinner as they reach your feet or run straight down (but they should never move outwards, you don’t want to look like Disco Stu). For skinny guys, the former option tends to look better as it makes the legs look slim without making them look thin and is also recommended if you are of average build. For larger men, however, we suggest going with a pair of dress pants that run straight down and maintain the same dimensions from the thigh to the ankle. Dress pants should also stop at the ankle and should never run over your shoes. 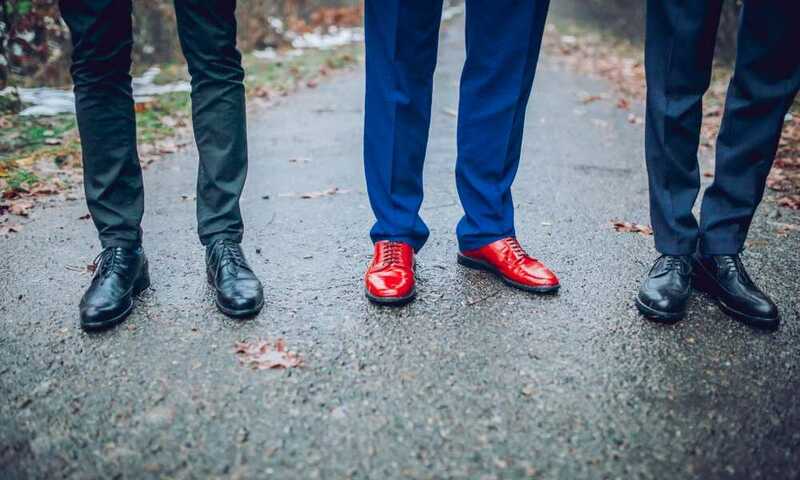 In fact, there should be a quarter of an inch or so between the hem of your trousers and the topline of your shoes, so be sure to choose a pair of socks that are in keeping with the evening’s dress code. There is a myth that dress pants are uncomfortable. If you have felt uncomfortable in dress pants in the past, it is most likely because you failed to find a pair that properly fit your body. If you keep this article in mind when searching for your next pair of dress pants and pay careful attention to the waist, thighs, and hem of each potential purchase, you’ll have a greater chance of finding a pair that compliment your body and work with your figure as opposed to forcing it into a certain shape. With the right pair of dress pants, you’ll likely stop dreading having to get dressed up for formal events. In fact, you may even come to enjoy it! Can You Wear Dress Shoes with Jeans?